ⓘ This is a liquidation product, There are only 2429 left at this price. With a special round body design, this product is intended to be used in identifying high and low heart tones as well as cardiovascular sounds. It's made from imported PVC with high durability and resistance to aging, and the conducting tube features a two-channel design to achieve better conducting performance, enhanced volume and balanced auscultation between two ears. Each chest piece is equipped with three sound-collecting bells of large, medium and small sizes, which are suitable for auscultation of infants, children and adults as well as fetal heart sound, breath sound, and high and low heart sounds respectively, based on the area of auscultation and range of frequencies to achieve an optimal sensitivity of frequency response. Produced from 62 copper decorative chrome plating with exceptional surface finish and high durability, the ear piece is designed to be automatically adjustable according to the user/s facial form and angle of auricles to achieve an optimal performance of wearing. Manufactured from highly flexible PVC synthetic material, the earphone can perfectly fit the auricle with no sound leakage and feels good in long time use. Moreover, it can be easily disassembled and cleaned to avoiding infection of doctors' ears. 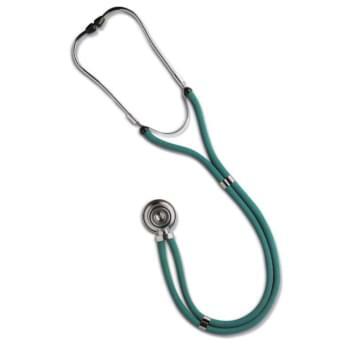 Acoustically designed for exceptional sound conduction, this set of stethoscope features up-to-date profile, high portability and a wide range of colors (no color choice) Suitable for the doctor in charge, professional nurse and medical researcher. The most popular stethoscope on the market today. Heavy walled 22" tubing blocks out extraneous sounds even in the noisiest conditions. The overall length is 32". No color choice.